High Production Speed up to 240 containers/min depends upon the type of vial. Servo Assisted Accurate label dispensing. Batch coding printing like Inkjet printing can be accommodating. Imported A.C. Frequency Drive for main drive. PLC system with touch screen HMI. Up to 240 Bottle / min. 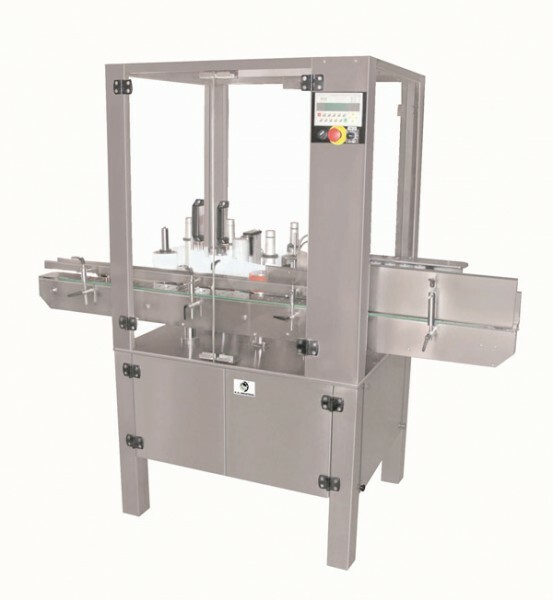 NKSAL -240, a High Speed pet bottle Labeling machine is used for labelling of round pet Bottle which is previously filled and sealed. Machine conveyor will receive container from infeed turntable, it will be separated by the feeding roller assembly to maintain the pre determined space between the two containers according to the label length and container diameter. Label is placed on the container immediately when it will be sensed by the container sensor, it ensures instant adhesive of label’s edge. Then it passes through the pressing unit resulting in precise registration and crease-free application.